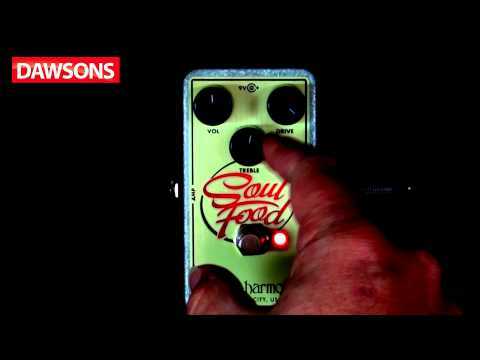 The Electro Harmonix Soul Food overdrive is another flavour of distortion from New York's finest effects alchemists. For this new model, EHX head honcho, Mike Matthews took inspiration from one the most revered of all vintage distortion pedals: the Klon Centaur. This very rare unit exchanges hands for insane amounts of money, so the idea was to produce a new alternative at a more affordable price. The Soul Food is the result. This compact pedal is built with EHX's super-robust die-cast chassis, and features kind of distinctive front panel graphic that we've come to expect from the brand. Controls are kept very simple, with just three knobs: Volume, Tone and Drive. A familiar, heavy-duty footswitch is fitted to switch the effect on. When designing the Soul Food pedal, the engineers at EHX aimed to create a pedal with transparent tone, that didn't colour the guitar's tonal character in any way, but was still more than capable of lifting itself out of a mix with clarity. This new pedal does just that. Despite this remit, the Soul Food is capable of a broad range of overdrive tones. Clean boost tones can be dialled in, as can heavily saturated sounds, and the full range between these extremes. The treble control provides the means to add a bright edge, but with a smooth character that is at odds with none of the harsh tone introduced by treble on many pedal designs. For those who use their pedals in a wide variety of situations, from live shows with long cable runs, to studio situations with far shorter cables, the Soul Food is well equipped. It can be switched between a true-bypass mode and buffered mode, providing a 'best of both worlds' solution. The Electro Harmonix Soul Food is the perfect overdrive for anyone who hankers after the legendary Klon Centaur, but doesn't have a rock-star sized budget to bankroll it, providing classic transparent tone, with EHX's trademark flair and reliability.